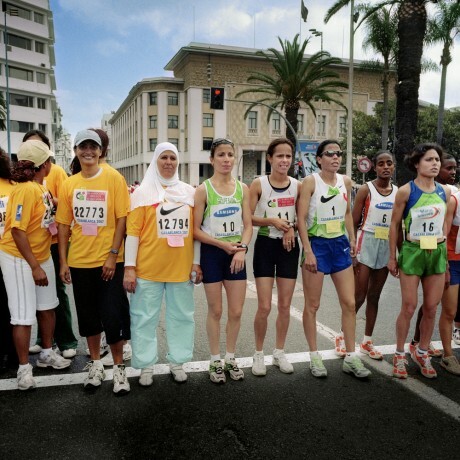 This photograph shows female runners competing in a 10k race in Casablanca organised by the Courir Pour La Vie (Run For Life) project. The project, which is supported by Moroccan athlete Nawal El Moutawakel, helps young women increase their confidence and independence and fight against gender inequality. Nawal El Moutawakel became the first African woman and the first Muslim woman to win an Olympic gold medal when she won the 400-metre hurdles in 1984. Women have made history again this year: this is the first Olympics in which all of the more than 200 participating countries have sent female athletes to compete. In fact, it is being called the ‘Women’s Games’. Qatar and Brunei are also sending women athletes for the first time. Panos salutes all the women athletes at London 2012.